Editor question: Should it stay or should it go? Normally, a reader asks a question about uncluttering and organizing that our writers answer with amazing input by fellow Unclutterer readers. Today, I have a question that I’m hoping readers can help me answer. We’re a military family. We’ve lived in 13 different homes in the past 28 years. Each house has been different. Some have basements, others have garages. Some homes had three bedrooms and one bathroom, others had four bedrooms and four bathrooms. We lived in houses with very little closet and cupboard storage, others with walk-in closets and walls lined with cupboards. A slat-wall system with various hooks and baskets. It has been used in garages in previous homes to store garden tools and bicycles. Our current home has a shed that won’t support the use of the slat-wall system. A plastic filing cabinet with broken locks and missing wheels. The cabinet was rather expensive. It is sturdy and in great shape so it could be used for storing something. It is currently empty. I have probably two dozen fabric drawer organizers. I’ve used these to organize clothes in drawers and items on shelves in various houses over the years. There are lots empty totes. I’m not sure what was in them at previous houses. They are all in great shape and have matching lids. I have a few shelf extenders. Our current home has adjustable shelves in the kitchen cabinets. Almost none of our previous homes did. I save car cup gum containers and Altoids tins because they are great for storing office supplies, cotton balls, cotton swabs, and other small items. There lots of each type of container in my stash because they might come in handy. There is a tower of plastic drawers that I’m sure could come in handy for something but it is currently empty. There are at least 50 ways to use a basket so I have baskets of all sizes in my stash. This includes a bunch of kitchen drawer organizers. Part of me wants to keep all of these items because we will be moving again in less than one year. I have no idea where we will be moving or what our next house will be like. I might need the organizing supplies because they are useful and I just love having lots of organizing products. 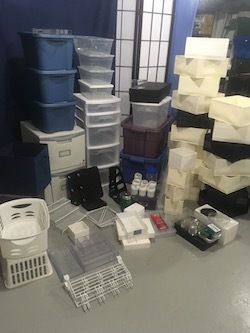 Another part of me wants to just donate all of the stuff and only buy what I need when we move into our new house because I just love buying new organizing products. My home is clutter free. (no duplicates, no just-in-case items, etc). That said, my “secret sin” is decorative ribbon – one large tote full of ribbon. I will use some, but not all in the next few years. I have no intention of thinning the herd. I love ribbon, to use, to inspire, to look at. May I suggest you view your storage items as your “secret sin” since you clearly love them. Keep most of them, esp since you’re moving soon. Maybe re-evaluate the inexpensive basket (they take up lots of space in moving boxes) and the free altoids tins. You need to compare the cost (both real and emotional) to store and move vs. the cost to replace if you would need it again after your next move. Yes, replacing all these items has a very real cost, but you may not need to. How likely are you to use them again? >50%? <25%? If you have to pay to store them (i.e. renting dedicated storage space) then they should go. If you are storing them in your living space, how much space do they take? Can that space be reduced by storing things inside each other? How annoyed are you that they are taking that space? How much space will they take in your moving truck? Will it force you into a larger class of moving vehicle? How well can you organize your organizing supplies? The large bins can stack inside each other., and will be useful for packing stuff in for moving. Can the fabric drawer organizers fold down to be stored flat in one of the tubs? I would get rid of the cabinet with the broken wheels and locks, or commit to fixing the wheels if you really love it. Those plastic towers of drawers take up a lot of space, and can’t be collapsed down. Can the drawer organizers be nested inside each other? Are these items taking up usable space in your current home? If you are storing them in otherwise unused space, then you can afford to keep them until you find out if they are needed in your new home. I would keep the slat wall system, as that can again be stored flat. “Just in case” is happening when you move again soon. I have found that as my kids get older, our storage needs have changed too. The plastic tower of drawers that held hair accessories or bath toys in the bathroom, or toys with small parts in a bedroom or living room may no longer be needed for your family’s storage needs, no matter the house. What you want to know is if “future you” will want/need these things after your next move. One way to look at the issue is say the future is unknowable, so live for who you are right now and decide accordingly. 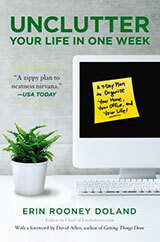 You love organizing..that is in your unique personality. That will not change. So really, the issue is money. Can you dump your stuff now and, if needed, afford to buy it again in the future? That is a yes or no decision. Lastly, if you dump the stuff now, there is no guarantee that you will be able to find the unique stuff, even if you can afford it, because trends and availability change. This decision should be discussed with the others in your family, who understand you, and ask for their input. Minus the military aspect, we’ve been in a similar boat the last few years. I decided to keep, but I limit my current unused stash to what can fit in 3 oversized totes. That way I have flexibility, but a cap on how much space it would take up. If it hasn’t been used in the last 2 houses, maybe it’s not worth moving further. Also, consider how easily these things can be obtained from a local thrift shop when you move. Mine is always overflowing with baskets, boxes, etc. Keep what’s in good condition, isn’t in your way, and you like. 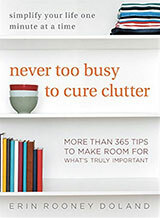 You move frequently and organizing is important to you so keep good organizational tools. Questions I’d be asking myself: How difficult/expensive will it be to replace these compared to how difficult/expensive it will be to store and move them? Do I want to move them to a new home, where they may not even fit, or wait until I’m in the new space and have a better understanding of what I need? Military wife here. I also deeply love my organizers and have a stash of supplies from oh so frequently moving. This has helped me develop a rule of thumb. If I don’t have room to store it or I haven’t used it in the last two homes then I get rid of it. For anyone not used to incessant moving it’s easy to say, “Get rid of what you aren’t using this moment!”. Decluttering, of which I am a fan, needs a different approach when your home changes frequently. What doesn’t help in one house may be perfect in the next three and it’s very expensive to buy new organizing solutions every year. Otoh, no one wants to look at a huge pile in a spare corner ever day, either. Just pare it down to whatever your space can manage. From another military wife and current geo-bachelor living alone in DC: As a frequent mover, I sympathize. However, looking at that pile of storage/organizing stuff depresses me. In my opinion, unless you have a large, unused room or corner of an attic or garage where you put this stuff away, out of sight, I’d get rid of it. Let it go and start over. I was also from a military family. First, unless things have changed, moving the stuff costs you nothing (the military pays), so that is not a factor. But it’s still clutter. I like the idea of “if I haven’t used it in the last two homes, get rid of it.” I’m assuming there are still thrift shops on bases; if not, I suspect there is some way to pass the still usable, but not needed stuff on to someone who can use it. (Freecycle, perhaps. At any rate, there are always military families who need stuff and don’t have a lot of extra money.) Unless you’re in a desert, Altoids tins, coffee cans, etc., will eventually rust, which gives you an excuse to get rid of them. Get rid of the broken cabinet and possibly the stack of drawers (the more you move, the more likely those will break or break more). Nest the totes. Do the evaluation to see what needs to go or stay. How much does it cost you to store it all–nothing because you can put it in the shed and ignore it? Or do you need that space? Getting past the “might be useful,” how much has actually been used in your past two homes? I’d get rid of Altoid tins and such–you can re-accumulate easily. Good luck! You will be moving or be transferred in a year. The military pays for moving but not for organizing a home. You have a shed. My suggestion is to toss it all in the shed because you will need all or most of it after any or all future transfers. Put the money you will save on not purchasing replacements in your savings account. Almost empty nester here, but there were 8 of us. Not frequent movers, but had a BIG move 10 years ago. I still use my large tubs from that. The clear plastic things break down over time and never look clean to me. If your baskets were wicker (my secret stash) I’d keep every one. Some of mine are almost 30 years old. Plastic, nope. My general rule is anything with a replacement cost under $20 can go without a second thought. Your value might be $5 or it might be $100. Clear real estate in my house is worth a great deal. Donating things to charity is the easiest weight loss. I also like to think that whoever gets my useful things might be really blessed by something that has been helpful to me. Warm fuzzies all around and no regrets letting go. 3) Buying new organizing stuff that is exactly what you need feels fabulous! I encourage you to hold on to your storage/moving pieces. With frequent moves a certainty you will need to use these items again. By keeping them you will have them handy for your next move. No need to run around and shop for them, again. No need to panic if a special item in no longer available. I bet you have your packing routine down to a science, You know what goes into what bin without thinking by now. Make you next move easier with the system you have developed and already own. As a former service member, I know the thoughts that go into: should I keep it or sell or donate it; will I need it at my next house? You mentioned that you are moving in a year, so you have probably kept those extra organizing items for at least that long already. So many of them are still useful and could be used for moving. I agree with Lisa, breakdown and combine bins. If you have space to store them, keep them. The ones that are broken, re-evaluate their usefulness and see if you have a use for them. If not, donate. The last use for my storage items is to recycle them or use them as a container to haul donations. It sounds like you may be close to retirement. Congratulations. I know that this would be a tough decision for me! But I am with those readers who say that the gum and mint holders have to go – unless they are currently storing something. Not only are they easily replaced, but you might want to replace them with something more elegant at some point. I am a basket fanatic myself and I have mine in a closet in our mud room. We are now in the empty nest stage of life. I still entertain a lot and use the baskets for those times, as well as for storage. But I have told myself that when we have to give up the house, at least half the baskets have to go. And that’s a rule of thumb I use often when I have a lot of stuff: keep half and toss or give away half. Keep the totes, they should come in handy to use for your next move.